If you've got the moolah and need a rock-solid, high-performance audio computer, you won't find this one lacking. …But not 'silent'. It ain't cheap! Rain Recording's PCs are purpose built for audio work, and the Element i7 we're looking at here sports Intel's mighty new Core i7 processor. Our test unit has a few extras, too, namely a solid state system drive, Vista 64 and acoustic damping. 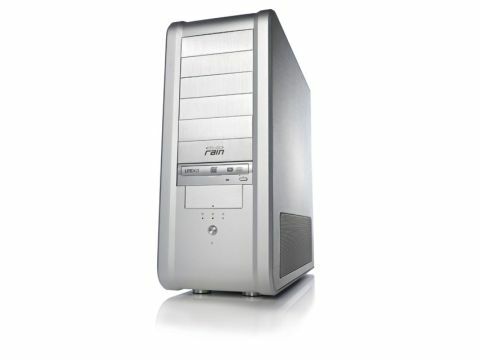 The basic Element i7 starts at £1599 for a package with two 500GB hard drives and Windows XP Pro. Everything is housed in a hefty aluminium case that's 60cm deep and almost as tall. There's plenty of space for upgrades like DSP cards, extra drives, etc, and the interior is very tidy. A ­lap on the front conceals four USB slots and a FireWire port. There's also a PCI FireWire card (TI chipset), providing ports on a separate bus. The system is preinstalled with Acronis True Image, which makes back-ups a breeze, and something called RainZone. This is basically Windows XP running in a Virtual PC shell, enabling you to browse the internet and access email (or whatever else you'd like to do), safe in the knowledge that if you screw up the virtual OS, the 'proper' OS will be unharmed. The system is quiet and doesn't hum like your average desktop, though it's not 'silent' due to the soft purr of the fans. As an experiment, we disconnected the fans and found that it remained stable when being put through its paces. The Core i7 920 chip is intended to operate at 2.6GHz, but can be overclocked in the BIOS or with MSI's Overclocking Center app in Windows. We got it to around 3.6GHz before it became unstable. Drive rattling is almost inaudible due to the NoVibes hard drive cradle (we reckon this and the acoustic panels should come as standard). The Intel solid state drive is, of course, entirely silent, and its speedy performance makes for a slick, responsive system. Overclocked to 3GHz, running a 44.1kHz Cubase 5 project, we created an audio channel with a WAV f­ile and an instance of IK Multimedia's T‑RackS 3 Deluxe running the Warm Suite preset in Oversampling mode. T‑RackS 3 is very CPU-intensive (it's mainly intended for mastering), so we kept on duplicating the track and found that we could run a whopping 32 channels before dropouts - the computer remained responsive at all times, too. By comparison, our Core 2 Duo laptop struggled to manage six or seven channels with the same setup! In a real-world mix, we were able to use 12 instances of T‑RackS 3 (in Oversampling mode), four of Overloud TH1, one Toontrack Superior Drummer 2.0 and more, reaching about 85% on Cubase's performance meter. With T‑RackS in Lowest Latency mode, the meter was around half that. As for hard drive performance, we were able to play around 125 tracks of 24-bit audio at 44.1kHz. This is by far the most powerful PC ever to grace our test bench and, what's more, we experienced no erratic behaviour during our trials. Of course, there are much cheaper Core i7 systems to be found online, and you may consider building a similar one yourself. However, the big selling point of a package like the Element i7 is the reassurance that it's been put together with audio performance and stability in mind. And it's all done by professionals, who will be able to give you audio-speci­fic advice, should you run into computer woes during the lifetime of the unit. For some users, this will be more important than making a short-term saving.